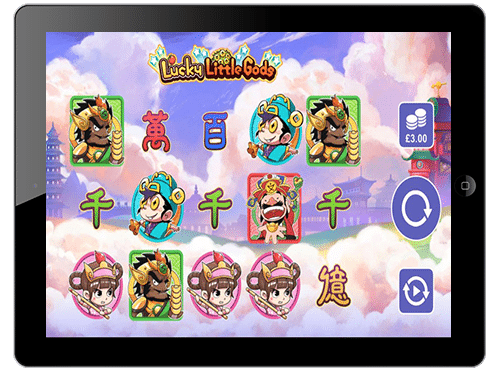 Lucky Little Gods is a new slot game launched by Microgaming. This slot is designed in a grid of five reels and 3 rows, and offers 243 paylines for achieving a win. This mobile slots takes its inspiration from the Chinese New Year and is deeply rooted in mythology as well as folklore of Chinese culture. As for the bonus rounds, this slots offers lots of bonus rounds including the Free Spins which offers handsome payouts to players. This slots offers maximum achievable winnings of 433 times of total stake in gameplay. Grab The Exciting Prizes which this Slots Offers! Before players begin scooping coins with the 2 little rascals, they should set adjust their betting limits. They can do so, by clicking on the “Coins Stack” icon which will enable them to set their bet limits which range between £0.30 to £30 and the bet value that goes up to £10. After this, players must click on “Spin” icon which will set reels in the motion or can also opt for “Autoplay” feature which can be used for auto spinning the reels. Aesthetically, the game has very cartoonish designed graphics and is well portrayed in a fantasy look-alike world up in clouds. The slot with Chinese historic temples in the background include symbols such as the Gods of Fortune with their apprentices and Chinese letters on the reels. The games logo is recognised as the wild icon and it can replace all icons bar the three scatters. During this round, randomly 1 of 2 little gods may show up and will award players an instant cash win ranging between 4x to 40x of the total stake. When a small Tree Full of the Coins lands upon screen, it will shake and the slots offers the players an instant cash win. However, if it lands upon row three, then also it will award players with an instant cash win for the icon underneath it. Whenever players get golden pot icon upon reel three, it will award them anything between 20x to 100x of the total bet. The main attraction of this slot is its Free Spins round which is playable when players land 3 to 5 firecracker scatter icons in any place on the reels. After which, it will reward them with 8 to 10 free spins respectively. Moreover, both the first and the fifth reel will become entirely wild during this round and will enhance the players winning payouts. 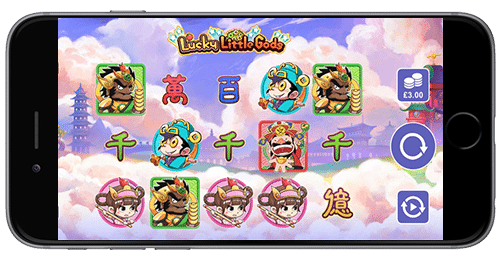 Lucky Little Gods is an entertaining mobile slots launched by Microgaming. It has jam-packed bonus features which offer handsome payouts at regular intervals. The slots offers medium variance and comes with an RTP of 95.02%.